This unit study is for younger children up to 4th grade. 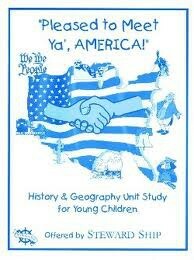 Use for young students as an American History and Geography study spanning one to two years. Students learn about: Columbus, the Pilgrims, American Revolution, Founding Fathers, and Westward Movement/Pioneers and more. You will be able to teach many basic concepts and integrate skills and subjects through this study such as reading, writing, art, activities, timelines and more. From Stewardship Publishing.